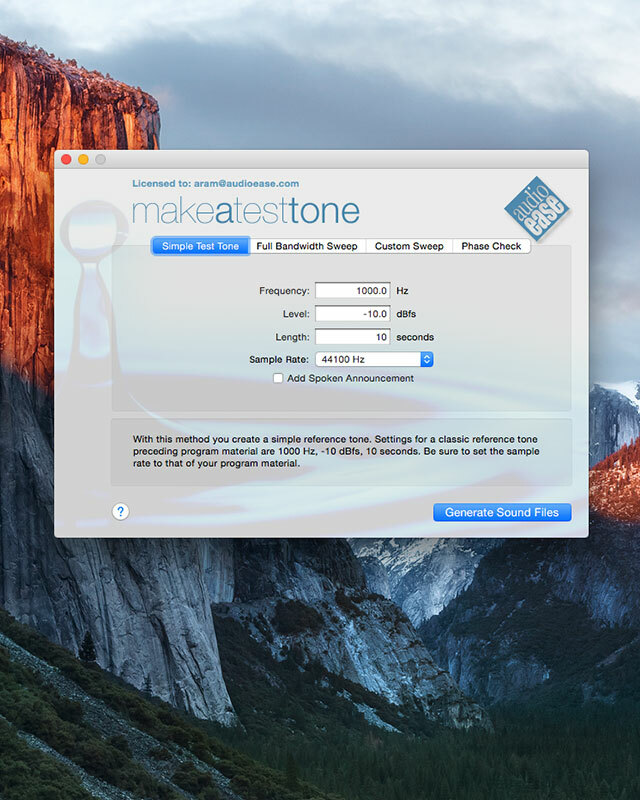 Easily create super high quality test tones, sweeps and audio files to check the phase of your speakers in an instant with this application for Mac OS X. Extensive help and instructions are in the application's help menu. 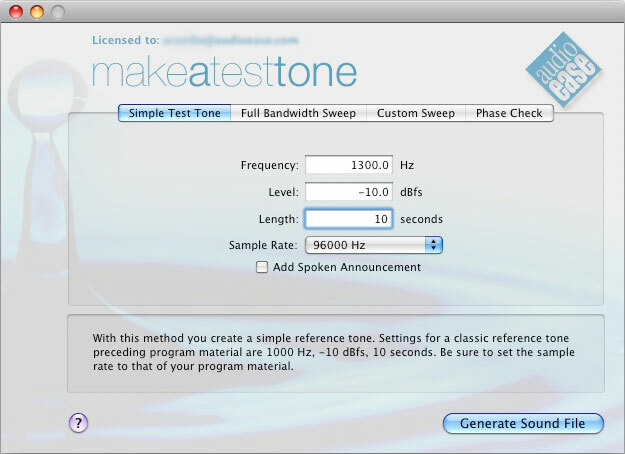 What is Make a Test Tone? 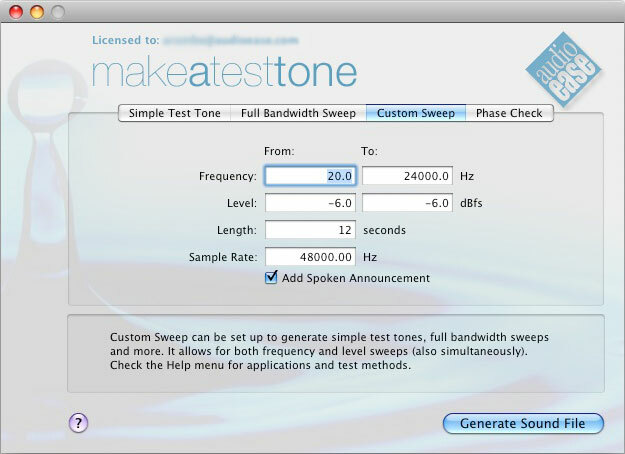 Make a Test Tone is a generator of sinusoidal audio test signals, and spoken phase checks for speaker configuration up to 10.2. It calculates flexible, highly accurate signals that are saved to either AIFF and WAV (BWF) sound files up to 192 kHz. In addition it drops markers in the sound files, indicating the exact frequency or amplitude at that spot. Why do I need Make a Test Tone? There is a variety of situations where test signals come in handy, ranging from standard reference tones preceding recordings (with Make a Test Tone you can choose to introduce the specs of the testtone with spoken word), to measurement and adjustment of room acoustics. In general, test tones can help detect deficiencies in acoustical, recording, signal processing and wiring situations. Why did Audio Ease create this app? Audio Ease has used the signal generating algorithms within Make a Test Tone extensively in the production of signal processing algorithms. We have, for instance, been using these tones for quality checks of the sample rate conversion, word length reduction and look-ahead compression algorithms in BarbaBatch (our batch sound file conversion package). The tones have proven to be a very valuable addition to listening tests with musical and speech fragments. With the third option it is possible to create the tones and sweeps of the first two and more, but you will need to pass more parameters. Then you supply the chosen algorithm with a few parameters describing the exact test tone you desire, using the radio buttons and editable text boxes. When you have done that, you push the ‘Generate Sound file’ button at the bottom right: a ‘Save’ dialog appears. You choose a name for your sound file or leave the one that is suggested by Make A TestTone untouched, you navigate to a folder where you want to save the sound file, and you choose one of the available sound file formats: AIFF, WAV (BWF). Then you click ‘Save’. When processing time exceeds a second, a progress bar will appear. A linear fade out of 0.5 ms is applied in order to avoid a click at the end of the file. Since the starting phase of the generated sine is always 0, a fade in is not needed. We will now go through the three algorithms, their parameters and their applications one by one. For this tone you need to choose a frequency, a level, a length and a samplerate. The tone will be invariable in both amplitude and frequency. For the samplerate you should choose the rate of your digital program material. A marker is dropped at the start and the end of the resulting soundfile, listing the tone’s parameters. You can only see these marker when the soundfile is opened in editing software that recognizes markers. A standard application for these tones is the reference tone that is often required preceding recorded material on tape or disk. Classic values for such a tone are 700 Hz, 1000 Hz, and 10000 Hz, all at -10 dB and lasting 10 seconds each. These values are standard frequencies for adjusting equalization, bias, levels, tape speed and azimuth on analogue tape recorders, but are still often used in the digital domain. If you put one or more reference tones before a recording, make a 20 second silence between the tone and the program material. This will allow for future fade-ins of background noise, and, more importantly, this is a safe margin for any copying effects that can occur due to the layers of tape being wound on top of each other. Be sure to fully document the reference tone(s) of your choice. With this method you create an exponential frequency sweep ranging from 5 Hz to half the samplerate of your choice. (At a samplerate of 96 kHz, the tone sweeps from 5 to 48000 Hz.) You can supply a (constant) level. The sweep is exponential. This means that it rises with a fixed number of octaves (or 'interval'), not with a fixed number of Hz per second. Approximately two markers are dropped each second, containing the exact frequency at that point. If you want to know where the markers are dropped and why, read the section ‘About Markers’. Since all frequencies from 5 Hz to over 20 kHz are covered, the sweeps produced in this way can be used to check the shape of the frequency response of a filter (almost all elements in a signal path can be considered filters, see ‘About Frequency Response’). The envelope of the resulting sweep, or the shape of its waveform overview, is actually the frequency response, or the filter curve, you wanted to examine. If you have software that recognizes the markers dropped in the sweep file by Make A TestTone, the x-axis of the display can be used as a ruler for frequency. Checking the quality of a sample rate converter. If you need to decide on a sample rate converter to use on critical material, you will want to take a close look at the quality of it. Let’s take a typical CD pre- mastering case. create a Full Bandwidth Sweep at a samplerate of 48 kHz, at a level of -3 dB, of 20 seconds in length. Use a samplerate converter to convert it down to 44.1 kHz. Make sure that the playback machine’s clock is set to 44.1 kHz before playing the result back. (In SoundDesigner, for instance, this is done using the Hardware Setup dialog). Perform this test with all samplerate converters you have available and pick the best. (Do not forget to download the latest BarbaBatch Demo from the web, to include both its samplerate converters in the test...) If you want to perform the test with different samplerates you can use the ‘Custom Sweep’ method. In the above examples we stayed in the digital domain, since it is far less complicated than performing similar tests in the analogue domain. It does not suffice to simply listen to a sweep played back in a room if you want to draw sound conclusions about the acoustic characteristics of that room. You’ll be measuring a lot of things at the same time: playback system -> amplification -> speakers -> room -> ear. The peaks and dips that you notice can be in either of these filters in the chain. In general you want to isolate an element from the chain to find its characteristics. This can be done, for instance, by knowing the frequency responses of all other elements, and taking them into account when observing the results. Some professional equipment is supplied with a frequency response measurement chart, enabling you to do just this. In lab situations anechoic rooms are used for the same reasons: excluding, in this case, the room itself from the complete measured chain. Using an accurate level meter (in your mixing desk) at various stages in the chain can help too. While playing back the sweep, the meters follow the frequency response of the element you are measuring. Try your own room with a Full Bandwidth sweep to observe how flat the complete chain is. Often you will hear very distinct peaks and dips. If you want to ‘zoom in’ on the suspect area, use the ‘Custom Sweep’ method to narrow down the frequency parameters, while remaining the length. Recording the sweeps back into your hard disk recorder allow you to view the envelopes (the frequency response) of the results. You can use this method if you want to ‘zoom-in’ on problem frequencies. You can use the level sweeps to prepare test input for dithering algorithms. Use these sweeps for investigating crosstalk in various equipment. A lot can go wrong when wiring your studio. You want to check whether your speakers are all in phase. When you have cross wired any of them, or the connections between your mixer and your DAW, this will show up in this test. You should drag these in a surround session (ProToos, Digital performer etc.) A female voice will speak each channel name (i.e Right Surround) in the proper channel. Then it will playback in and out of phase sounds for each stereo set i.e: "right and right surround channels. In phase (burst of pink noise), In phase (burst of pink noise)" When you listen as far from the right speaker as the right surround speaker, This should localize firmly in the center between both speakers. It should sound full and solid. And then it will say the following with the left channel phase shifted 180 degrees (exactly in opposite phase): "out of phase (burst of pink noise), out of phase (burst of pink noise)" This should sound outside the speakers, or even behind you, and thin. Not at all full-bodied and in the center. If it sounds the other way around, you should cross-wire the last speaker of the two: the right surround speaker, and restart the test again. Note: Digital performer does not like the .sd2 extension after soundfilenames, so uncheck 'append filename extension' when creating sd2 files for DP. The sound files produced with Make a Test Tone will contain markers that display the frequency or level at a given point in time. When a soundfile is viewed in an editor that recognizes markers (SoundDesigner), they can be used as a ruler for frequency or amplitude. The file will have at least two markers: one at the start and one at the end, indicating both amplitudes and frequencies at those points in a (rather) high precision. If the file is longer than half a second, it will also have approximately two markers per second. If it is an amplitude sweep (with constant frequency) the markers will just indicate the level in dB. If it is a frequency sweep (whether or not combined with an amplitude sweep), they will contain frequencies only, in 2 digits precision. In fact, these frequencies are very precise, as they are chosen, and the positions are calculated from them. If the file is very long, or the range is very small, there will be less than 2 markers per second. 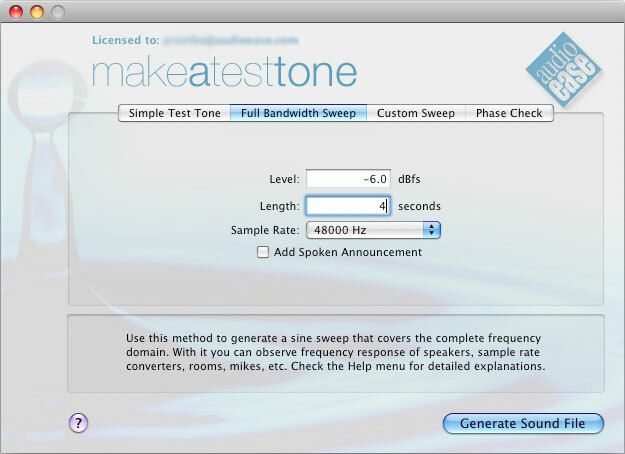 An important concept to know when using Make A TestTone is frequency response. Consider the following signal path: D/A converter -> equalizer -> compressor -> amplifier -> speaker -> room -> ear. Every element in this signal path can be considered a filter: as having an effect in the frequency domain. Some of them mean to, others do not. The frequency response of a filter (an element in the above chain) is called ‘flat’ when no frequencies are attenuated or boosted more than others. Most microphones, AD/DA converters, mixing desks, sample rate converters, speakers etc. are designed to approximate such a ‘flat’ frequency response: what goes in must come out sounding as much like the original as possible. 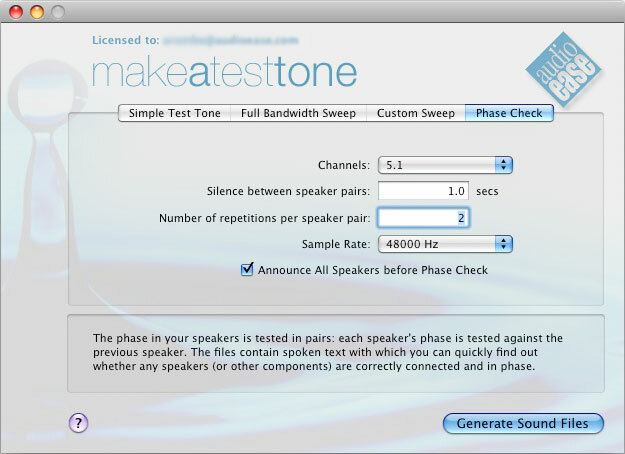 The Make a Test Tonen demo app for Mac OS X does produce sound files, but these files only contain silence. The demo can be unlocked with a key code. You can unlock the demo to the full version with the activation code you receive after purchase.